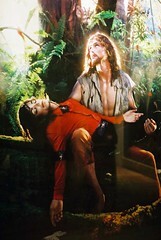 The recent photos made by a pop art photographer David LaChapelle feature Michael Jackson. The photographer whose previous work had been garish and over-sexualized said he was burnt out after many years of work with celebrities and spent the last 5 years in a remote part of Hawaii seeking the lost Paradise. He says that the retreat saved his life. It also moved him to create a series of photographs portraying Michael Jackson as a misunderstood angel and martyr. The motifs he is using are the religious ones. LaChapelle says he wants to talk in a different language and try to get people to see beauty. LaChapelle is synonymous with contemporary pop culture. But after two decades of photographing the brightest stars in entertainment and fashion, LaChapelle was burnt out, so he made the decision to retreat to a remote part of Maui, in Hawaii. “I was pretty much working myself like crazy and wasn’t taking care of myself, so (coming) here has really sort of saved my life in a way,” he told CNN. That was nearly five years ago, and the work he has made since is, fittingly, based around the theme of salvation, melding religious symbolism and Renaissance art motifs. Religious symbolism and art historical references ranging from Botticelli to Michelangelo abound in this new work. Some critics have taken offence at his imagery. To LaChapelle, though, it is beautiful — and, he says, beauty can be a useful tool for communication. “Beauty draws people in whereas (ugliness) repels them, and aggressive imagery repels them, and to document things straight on the nose — that’s the job of a photojournalist. That’s not my job,” he said. These days, though, LaChapelle’s work is fed by the natural environment, reflecting his spiritual regeneration. Many of his images are based around the theme of paradise regained with Maui’s lush rainforest recast as an Edenic landscape where lost souls can find redemption. Serious themes such as America’s dangerous obsession with consumerism and the plundering of Africa are explored in his recent work, but interpreted in a signature style that doesn’t shy away from bright colors or well-known faces. “What I try to do is get (people) to see it with beauty,” he continued. David LaChapelle pays tribute to Michael Jackson with a new image portrait that shows the late King of Pop as a modern-day martyr. “I don’t think he was capable of hurting anyone. I think there’s something really biblical about what happened,” explains David LaChapelle of Michael Jackson’s life and pedophilia accusations. Spider-man: Nice to know not only the fan community realizes the depth and impact of the allegations and the critique it makes of society. Powerful_mind: “What is his “demons”? The words “demons” could be used to describe all the crap that followed Michael and the things he had to deal with all of his adult life be it from his own doing or people who were just out to get him. Things like the accusations, his dissatisfaction with his appearance, loneliness, stardom and all the problems it brings (paps, money grubbers), etc… Just everything that could have been viewed as a negative that never really ever went away. Until yesterday I had never heard of David LaChapelle’s name. Now that I know the story of his spirit being reborn I find it amazing. AMAZING. To see a man like LaChapelle – you need to have a look at his earlier photos to see what I mean – REVALUATING HIS LIFE is like seeing a miracle happening right in front of your eyes. Is the world taking a turn for simple but true values at last? Something Michael always kept telling us about? Wasn’t it him who called out to each of us to look at ourselves in the mirror and make a change? A top fashion photographer who has grown sick and tired of the consumer society? It sounds like a chef who has had enough of food. But this is the story of David LaChapelle, darling of celebrity snappers, who moved from New York to an 18 acre off-grid retreat in Maui, where his bedroom is surrounded by kava, a tranquilizing plant that can inspire vivid dreams. “I always used to pray for a cabin in the woods with vegetarian food and a place to make my art,” David told a reporter recently, his trucker hat twisted sideways as he reached into a gallon-sized jar of honeycomb, harvested from a nearby beehive. So David, who designed the sets for Elton John’s: Las Vegas show, completely removed himself from the universe that he had defined for decades. He went to its antithesis: Hawaii, more specifically, a farm on the island of Maui. “I decided I had said everything I needed to say, so I moved to the farm.” The property had been a small working farm and a nudist colony, and being the only private land in the middle of a state park—proved an allure for a man known for being at the center of the scene. Burnt out after two decades in the world of fashion photography, where he became famous for his surreal portraits of pop stars like Pamela Anderson and Britney Spears, the Warhol disciple called it quits, left his homes in New York and Los Angeles and purchased the former nudist colony on the Wainapanapa coast, overgrown with bramble and teeming with mosquitoes. He spent much of his first three rainy months staring up at the sky in the Italian marble bathtub he had installed outside his cabin, nestled in a jungle of ferns, dragon-fruit plants and night-blooming jasmine. The property is protected by a virtually impenetrable wall of hau bush — an invasive, woody plant — and morning glory. The main, plantation-style house, completely solar-powered, has five bedrooms, three bathrooms, a library, a caretaker’s apartment and workshop. Wood-louvered doors recycled from an old hotel make up the sides of the home, the kitchen was fitted with local eucalyptus and the armoires, library shelves and canopy beds were made of koa wood from the Big Island. Black pebbles coat the shower floors to simulate the texture of the black-sand beach nearby. Outside a 30,000-gallon rain catchment barrel supplies water. Goats provide milk and fertilizer and frogs were provided to catch mosquitoes. There’s a waste, vegetable and bio-diesel refinery; a Mercedes painted in pink camouflage runs on vegetable oil. “Very few people from the mainland would put up with all that — mosquitoes, rain, solar power — but it’s unquestionably the right place for him,” says Craig Maldonado, Mr. LaChapelle’s designer and project manager who lived on the property for two years during construction and oversaw 35 employees. The King of Pop Art has left the building. LaChapelle spent two decades recording pop culture, mirroring it back to itself before flipping the genre on its head and taking a shot from that angle. He was one of the most coveted editorial photographers, working constantly for the likes of Vogue, GQ, Vanity Fair, and Rolling Stone. He couldn’t get enough, always with a camera in his hand, always working, working, working, wanting to take a shot of everyone, everyone, anyone who mattered. He wanted those shots to be the definition of the subject’s life, of their celebrity, to capture the glamour in a way that no other photo could, so that in decades, in centuries, someone studying this time period could look at that one photo and know who that person was. Mr. LaChapelle shot for Vogue and Vanity Fair and directed music videos and commercials for the likes of L’Oreal and Burger King. Celebrities were drawn to his irreverent style. When his manager Fred Torres suggested he start showing in galleries, he says Mr. LaChapelle reacted angrily. “He said, ‘Nobody wants to see me, they want to see Britney Spears,’” recalls Mr. Torres. After his first 90 days in Hawaii, during which it rained constantly, Mr. LaChapelle called Mr. Torres and said he’d reconsidered. They flew to the Sistine Chapel the next week and set to work on his “Deluge” series — a collection of photos depicting floods in Las Vegas (the city of sin), a cathedral and a museum. “Deluge: Musuem,” a photograph of four paintings sinking in a flooded museum, fetched $139,240 at Sotheby’s London auction in June, nearly three times the November sale prices of Mr. LaChapelle’s life-sized portraits of Madonna and Ms Spears. Living in Hawaii has infused Mr. LaChapelle’s work with a new optimism. For a photograph last month, Mr. LaChapelle’s team constructed a raft from wooden planks and rusty barrels for a photo inspired by Theodore Gericault’s 1819 painting, “The Raft of Medusa,” now hanging in the Louvre. In Mr. LaChapelle’s version, the sinners he depicted in his Las Vegas flood have cobbled together a raft and, instead of going into the storm, they’re sailing into paradise, he says. From Noah’s Ark back to LA. “I had sort of said everything I wanted to say about popular culture,” he explains. He didn’t know when he’d come back, or if. But then, during his time away, he saw something in that mirror he had used for everyone else. He saw himself. It was a fresh angle, and, looking at it, he knew who that person was…And he couldn’t stay away for long. You can’t escape his work. It’s everywhere. It is not confined to the walls of a gallery or the pages of a magazine. He directs commercials and music videos, creates ad campaigns for some of the world’s top brands. Remember that quasi-disturbing image of Christina Aguilera with her lips tied neatly shut with black string, tears cascading down her flawless cheeks, blue eyes upturned in pain? That was LaChapelle’s for a Declare Yourself campaign. He directed a five-minute commercial for H&M, titled Romeo & Juliet. He has done campaigns for Motorola, Sky Vodka, Bebe, Phillip Morris, and more. And although the shots cross categories and defy characterization, they have one common thread: They are instantly identifiable as being taken by David LaChapelle. Rather than reserve himself for the wealthy and for the elite, LaChapelle feels that Jesus would speak with and for the people in the streets, for the less fortunate and the downtrodden. The island proved to be a pleasant retreat for LaChapelle, but it wasn’t long before he was approached by a gallery to create a series of original art. From that isolated patch of land, returning to L.A. was like stepping back into a different world. The resulting series, Deluge, reflects that contrast. This ideal runs rampant through much of his recent work. Its origin can be traced back to Rize, the 2005 documentary about krumping, filmed in the streets of Los Angeles. He never had any interest in doing a documentary, but upon seeing these kids—downtrodden, less fortunate, people of the streets—who were making beautiful, dancing art, he couldn’t not do the documentary. “Rize was about some marginalized people who have no money, creating art from nothing. The true artist will find a way to create and the means to do it….The process [of creating Rize] and the end result were so full of hope,” he explains. “It had a hopeful and heroic message.” Against all odds, art will always find a way to flourish. It was upon finishing that film, one of the best-reviewed of 2006, that LaChapelle’s whole attitude and outlook on life changed. He retreated to Hawaii and reevaluated his life, thinking about what was important. Merry Christmas and a Happy New Year to you all! My co-admins and I wish you love, harmony and a great amount of strength and good health we all need to stand up for Michael next year! Today I’ve received a beautiful video from THE MICHAEL JACKSON TRIBUTE PORTRAIT SITE (now added to our blogroll) the message of which I whole-heartedly share. It expresses the thoughts which are on the minds of many of us these days. The holiday season is upon us. It’s a time for family and friends to come together in love as we’re reminded of what is most important in life, caring for one another. That goes for our worldwide MJ family as well. We are a global empowered family, brought together by one remarkable man. Our community itself is a testament to the power of Michael Jackson. How many other entertainers can say they have an entire community? However, we are a community in need, because our feelings of loss are still ever present, and that leaves us vulnerable. Anything negative that surfaces about Michael still hurts us deeply and has the potential to divide us. But, in spite of our differences, we must not let that happen. He would not want that. There can be only one Jesus, and there can be only one Michael Jackson. That’s all I have to say. Crucified by the media AND the public. We shouldn’t pretend that we are better than we are. Olga, thank you for the links again – the post is now updated with all of them. The story of LaChapelle is amazing. Looking at his previous works one can’t help thinking he was deeply ill with all the ills of today’s world – however his transpormation through the healing power of the nature is incredible. Another proof that purification is possible for all of us no matter how low we’ve fallen. And when a man has done so much to clean his spirit he is worthy of so much respect that no one can point a finger at what he did before. Teva, it was LaChapelle who named Michael Jackson “American Jesus” – however not to insult anyone’s feelings I’ve removed that title leaving only the second part of it which is “Archangel Michael” (which he probably was). Anyone who is a true follower of Jesus and of what he said is his brother or sister – as we have one Father. Jesus said so. Merry Christmas to you and everyone! “Wishing you all a VERY merry Christmas! Wishing you love, harmony and a great amount of strength and good health you and we will need to stand up for Michael next year! P.S. I have just found a message from the Michael Jackson Tribute Portrait in my email and immediately added the site to my blogroll (can’t understand why I haven’t done it before). Suzy, Merry Christmas to you and all of us! Oricon has continued to reveal its sales rankings for 2010, announcing the Top 50 DVDs and the Top 10 BDs of the year. The top-selling DVD was Michael Jackson’s “THIS IS IT,” which sold approximately 803,000 copies of the Deluxe Collector’s Edition. Adding in the sales from the regular Collector’s Edition (322,000) and the limited Memorial DVD Box (10,000), “THIS IS IT” was the only DVD release of the year to sell more than 1 million copies. To top it off, the Blu-ray version sold 357,000 copies to rank #2 on the BD chart. “THIS IS IT” is Jackson’s first video release to ever be #1 for the year. This also marks the first time that a documentary DVD has been the biggest seller of the year. I don’t know if you have seen Reverend Barbara Kaufmann’s article in MJTP. It’s amazing. I hope Christmas was filled with joy and laughter. Helena I sent you an email. Will talk to you all soon. “Will talk to you all soon”. “The Discovery Health Channel, has circulated a picture of Michael, prepared for an autopsy. Many of you have seen this picture… However, already it has been accelerated by copy cat pictures that show Michael with his chest ripped open, and his brain out, and laying on the side. It gets worse…but what I have said is already hard enough to bear. It is critical that we come together and work to change this. We can do it, but we must be strong and we must be united. In the spirit of Martin Luther King, and for the love of our beautiful Michael…We shall overcome. Be there, we will discuss how. Guest speakers are AndJusticeForSome, Seven Bowie from MJJ-777 blog, Budsgirl and Lovelightmagic from MJ Justice Project. There was a show on CNN – ‘ICON’, last week. It was about three very special photographers. LaChappelle was one of them; I kept watchin cuz photograpy is a big hobby of mine. To my surprise, I saw David talking about Michael and showing the pictures. It was amazing. My heart stopped beating for a moment. As I understand, Michael never knew about the pictures? I’m sure, I’m certain he’d absolutely LOVE David’s work. As I’m sure that they would hit it off really great, because they had so much in commune. Iam in total agreement! I saw Michael’s God essence, his heart, his truth, his soul..when Iwasn’t even a fan! I never believed the lies, well maybe it is easy for me..because i don’t look at people the way most people looks at another..I look straight into the heart. And I do not get easily caught up on the hollywood thing. Michael’s life is in agreement to many who do God’s work, who are messengers of LOVE, PEACE, Unity, and Justice..All God’s messengers have been tortured, betrayed, lied about, and murdered! etc.. All had to go through some kind of imprisonment in one form or another; Nelson Mendela-spent almost 30 years in prison-for justice for his people, Joan of Arc-burned at the stake, Ghandhi-shot, MLKJR-shot, JFK-shot, JESUS-cruxified. John the Baptist-beheaded. I can go on and on..Michael’s life does have a biblical quality to it..No matter what the torture that was thrown at him, he never stopped forgiving them, he never stopped his mission in helping heal the world, he never stopped loving his family-friends, and never stopped helping those in need..and he did these things for he knew he was loved by God. And he knew that the ways of this world is only for short period of time..he knew after this life..FOREVER is what matters..Michael was angel/prophet of our time. May he RIP..I will love you forever..I will see you in paradise..